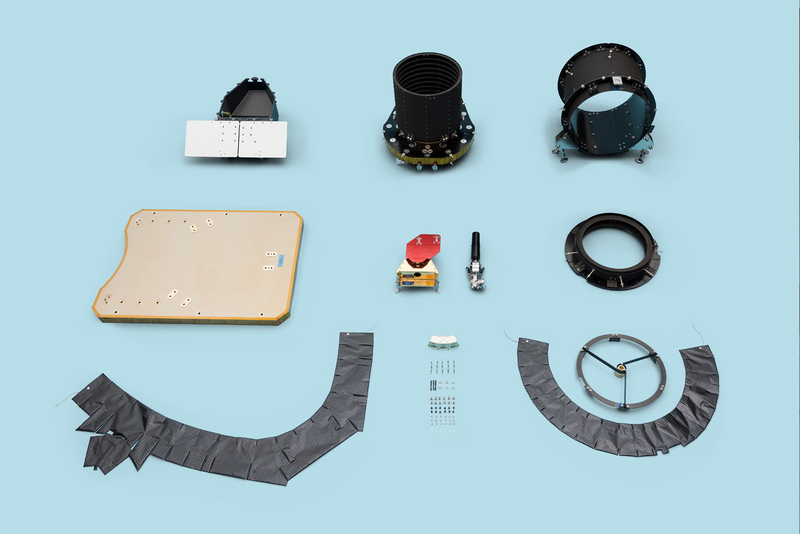 In the next months, engineers at the University of Bern will assemble the CHEOPS space telescope integrating parts arriving from all over Europe. CHEOPS, the CHaracterising ExOPlanet Satellite, is dedicated to study planets orbiting stars outside of our Solar System. Before building the flight model, the team used a structural model for testing which had to be assembled and dismantled several times. Click on the different parts to find out what they are used for. The triangular-shaped unit is a central part of the instrument. It houses the CCD detector array and the Front End Electronics. To achieve a very high photometric precision the detector has to be cooled down to minus 40 degrees Celsius with thermal stability of 0.01 degrees. Therefore, the unit also contains heaters and sensors that regulate the temperature. It is composed of lenses and a mirror to re-image the light collected by the telescope on the detector. A collimator lens makes the light rays parallel, a mirror deflects them to minimize the envelope of the whole optical system before a camera lens focusses them on the detector. The sandwich panel on the bottom carries the primary mirror with it’s diameter of 32 cm. It has to be precisely plane. The black tube carries the Spider (5) with the secondary mirror. The tube must be very stiff and has to be heated to stabilize the temperature around minus 10 degrees Celsius. The bright rectangles radiate the excess heat into space. These radiators are coated with a very emissive coating and connected to the Focal Plane Module (1) via many of layers of silver foil (under the red cover in (1). The black part on the back is a protective element made of carbon fiber. The carbon ring holds the secondary mirror and fixes it to the Optical Structure (3). The secondary mirror with its diameter of 6.8 cm has to be placed 30 cm in front of the primary mirror and reflects the light beams back to the Back End Optics (2). To reinforce the Optical Structure (3), a stiff ring will be mounted on top of it. The black cylinder will be put over the Optical Structure (3) leaving some empty space in between the two tubes. The little bright parts that are visible on the top inside are spacers that guarantee a correct placement. Brackets will hold a second set of heaters and sensors that guarantee a survival temperature of not deeper than minus 40 degrees Celsius. It is placed all around the instrument and also between the Optical Structure (3) and the External Telescope Tube (6). It provides insulation from the external environment. The material used widely in space industry consists of thin polymer films with vapour-deposited metal. The construction with many separate layers works like a thermos jug. The material can be white, black, silver or golden as shown on first CHEOPS design drafts. The engineers switched to black because it radiates heat best. The panel on which the telescope is mounted. You can see the marks where the Optical Structure (3) and the Telescope Tube (6) will be screwed on. Below the panel with the instrument there will be the spacecraft platform that is built by Airbus Defence and Space, Spain. Whereas the scientific payload only weights 60 kg, the mass of the whole spacecraft is about 280 kg. It will orbit the Earth at 700 km altitude. Launch is planned for end of 2018.
ready for assembling the different parts. The little white device on top is a cable connection box. It will be fixed to the Telescope Tube (6). Click here to have a look at the assembled CHEOPS model.